As you crack open the lid you will first take notice of the Steelseries keyboard with an all new and improved silver lining design. The GT72s always use the best CPUs, and with the launch of Intel’s 6 Gen Core CPUs, they are keeping up with tradition. This new CPU family is called Skylake and it has a much higher performance than ever before, but uses less power than ever. Take this for example: th i7 6828HK delivers a 30% higher performance than the i7 4728Q all while using the same amount of power. For an added bonus the new CPU can be clocked up to 4GHz. The GT72 Dominator Pro G features a high-end, class-leading audio performance with its HiFi speaker sound system manufacturer Dynaudio. Here we have a 2.1 sound system that doesn’t only play back sound with amazing clarity, it also does so at a sound pressure level never before seen from a notebook. In pure numbers it offers a 50% higher amplitude leading to an increase of over 10 decibels. A feature that many of us have seen in previous models of the gaming line-up is the SteelSeries keyboard. In the GT72 this mean higher responsiveness and tactile feedback while the layout has been optimized with WASD sound in mind. To make sure that you’re not left high and dry in the middle of your gaming experience, the GT72 paid further attention to the multi-key inputs. Also, with the silver lining keys you can see more, and do more, by making sure that the print on the keys were more easily viewable and they have longer longevity. See gaming differently with the NVIDIA G-Sync Display technology. By syncing the display refresh rates to the GPU, G-Sync eliminates stream-tearing and minimizes stutter to deliver the very best gaming experience. Objects look sharper and gameplay is more fluid and responsive to give the GT72 a serious competitive edge. 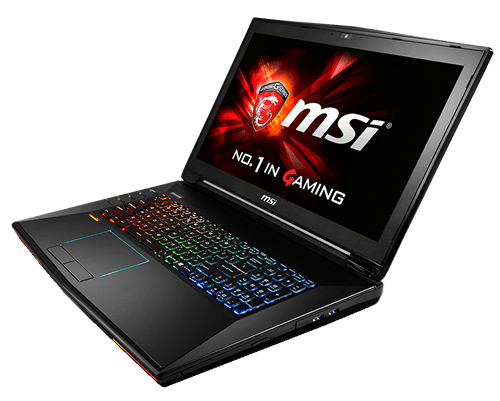 The NVIDIA GeForce GTX 980M-series brings extreme graphics performance for serious gaming notebooks. The GTX 980M-series offers +27.4% more graphics performance as compared to the earlier model 880M. It also supports the previously mentioned G-Sync technology with which gamers can play synced from 30-75%GHz on the built-in screen. You can push all of the limits of your audio peripherals and hear the difference with the Saber audio deck, supporting up to 24-bit and 192-kilobits per sampled rates. With a previously unseen signal-to-noise ratio of 122 decibels and an optimized design, headsets with an impedance of up to 6 ohms is no match for this deck. Protect and prioritize networking traffic while preventing issues and hackers so you can game without fear and play your best. Select programs that you want to network to prioritize and ensure maximum bandwidth and track your speeds with an easy-to-use killer networking manager. Killer Shield offers your GT72 Dominator Pro G another layer of protection with its best-in-class transformer, providing awesome and unprecedented surge protection. Whatever you need, you can get it done with your super ports. Transfer massive files faster than ever before up to 1000mb per second transfer rates. It will also charge our phones, tablets and other devices as well at extremely fast rates. You can expand your visual gaming experience up to 3 separate monitors, plus the built-in screen, for a maximum of 4 screens! How awesome is that? This should really keep you feeling right in the thick of things. Even though you can have up to 4 screens running, you never have to worry about it overheating, because it uses two dedicated coolers for both the CPU and GPU. Cooler Boost 3 is the GT72’s dual-fan cooler design, utilizing 2 dedicated fans with four cooling tubes really keeps the machine running nicely. Another element they added was the thermal bridge. He thermal bridge allows load sharing across the cooling elements, to make sure that your system runs cooler longer and harder. Coupled with the awesome Cooler Boost key you can get your fans running at 100% potential, allowing everything to remain cool as a cucumber. So what are you waiting for? 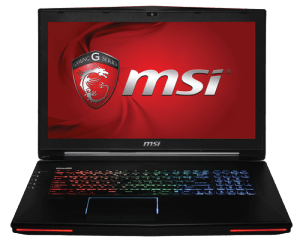 You can grab this machine for a mere $1,599.00, so go ahead, sell your laptop, sell phones, do what you have to do to get in the game! Time and money are both of the essence, and by selling our electronics, both are on your side!